Candice's Bridal Diary: Engagement Shoots – Yes or No? 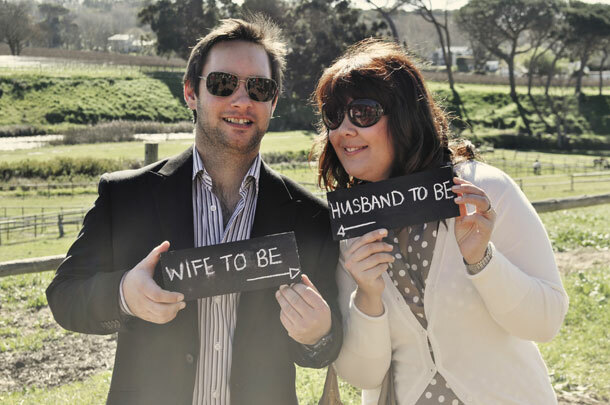 You are here \ South Africa Weddings \ Tie The Knot \ Bride To Be \ Candice’s Bridal Diary: Engagement Shoots – Yes or No? It’s just over a month till our engagement shoot – with our wonderful wedding photographer, Tiffany Burnham, and it’s prompted a few people to ask me “what’s the point?”. Well, we’re looking at it as more of a chance to finally get a decent set of “couple” photographs. Often when we’re out, it’s just the two of us – and we have to resort to the one-handed-self-portrait, with the hope that both of our heads will be in the shot. I’m sure you know what I mean. Now we have the opportunity for a full set of images, showing us in our cheesy and goofy glory- and also showing more than just our heads! We’re still trying to find the perfect surroundings for the shoot (if we’re going to have a woodlands shoot for our wedding, we don’t want it for our engagement shoot etc) and of course I’m trying to decide what to wear, but thankfully we have four weeks to make that decision in. I was set on the idea of an e-shoot (what all the “professionals” call an engagement shoot) before we even found a photographer – and luckily ours includes it in her wedding package. If yours doesn’t, or you’d just like a lovely set of images of you and your partner, most wedding photographers will charge around R1500 – R2000 for the shoot, generally at a location of your choice. It’s a great opportunity to use as a ‘trial run’ for you, your partner and photographer – you and your partner get the chance to become comfortable in front of the camera (in our case, learn not to pull silly faces and burst into giggles at every serious pose), and for your photographer to understand what works best for you as a couple. I’d recommend it for anyone – even those who are already married – why not book a couples’ shoot as your next anniversary present?